Girl Scouts of the USA Chief Executive Officer Anna Maria Chávez has long been a champion of making engagement with science, technology, engineering, and math (STEM) a vital part of the Girl Scout experience. Now, she’s being recognized for her leadership, guidance, and commitment toward improving STEM education—and advancing workforce development—as a recipient of a 2016 U.S. News STEM Leadership Hall of Fame award. What’s more, Anna will be inducted into the STEM Leadership Hall of Fame during a special ceremony and keynote discussion at the STEM Solutions National Leadership Conference, on Thursday, May 19, 2016, at the Hilton in Baltimore, Maryland. In addition to Anna, the incoming members of the 2016 U.S. News STEM Leadership Hall of Fame are: Norman C. Francis, president emeritus, Xavier University of Louisiana; Ellen Kullman, retired chair and chief executive officer, DuPont; Edward B. Rust Jr., chairman, State Farm Mutual Automobile Insurance Company; and John J. Tracy, Ph.D., chief technology officer, The Boeing Company. "These five trailblazers are an inspiration to all of us and are a driving force as the nation strives to bolster its STEM pipeline and equip America's students with the science and tech skills they'll need for both their personal and professional lives," said Brian Kelly, U.S. News editor and chief content officer. U.S. News is honoring valued innovators and visionaries whose initiatives collectively act as a blueprint for solving the STEM crisis. 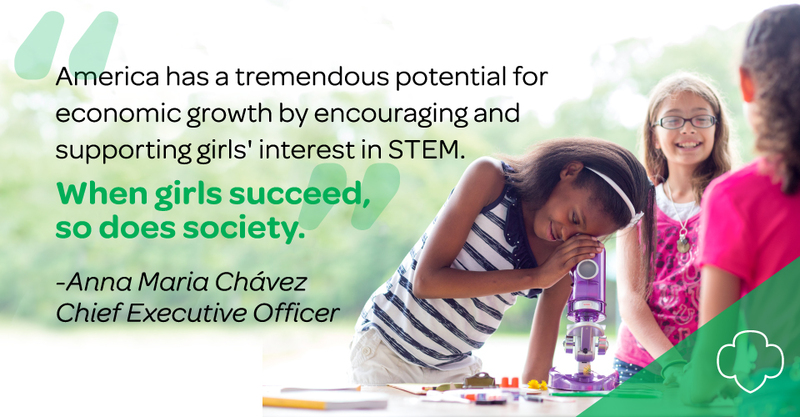 Learn more about how Girl Scouts are embracing STEM.